Are you one of those people who have a list of must-read books but never actually gotten around to reading them? And the list becomes longer and longer over time? Then here’s a clever solution for you book enthusiasts who feel they just don’t have enough time to finish a novel, let alone start one. I am sure you read lots of emails a day including unimportant ones like advertisements, notice of sale, or plain spam. Yet you tend to go through them nonetheless, spending about a couple of minutes or more when you are actually doing nothing and the boss is not looking. Now you can use those sudden bursts of idle time reading a few pages or a chapter of your favorite novel in email form. A much discreet way of enjoying your books over an actual e-book reader. Getting your dose of reading in email chunks will compel you to just read so you can finally start ticking titles off your book list. A number of sites are offering this service and here are two of the best ones to subscribe to. 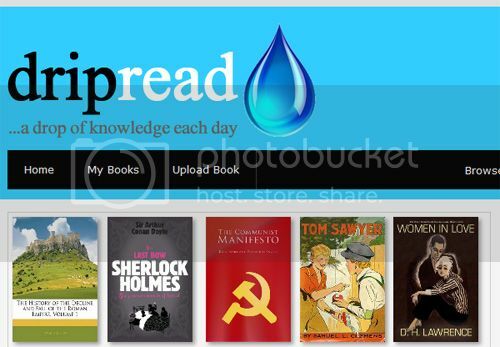 DripRead offers the brilliant idea of sending you installments worth reading for 5 minutes via email of the book you wish to read. Their collection is intensive and contains many of the timeless and much-loved classics that I am sure you told yourself once that you’ll have a go reading. There’s the adventures of Huckleberry Finn and the amazing stories of Sherlock Holmes. Once you’ve chosen a novel, the number of installments is indicated. And should you like to upload your own e-book so it can arrive to you in drips at your inbox, then you are free to do so. You can even share them with others DripReaders. Talk about flexibility and generosity eh? Another interesting development in this book website is their pursuit of making Open University lectures available. Fantastic for students and those who just want to keep the learning going and going. DripRead is yet to allow its customers to increase the length of the drips sent to you though. But at least for now you know you’ll get your 5 minute dose everyday. 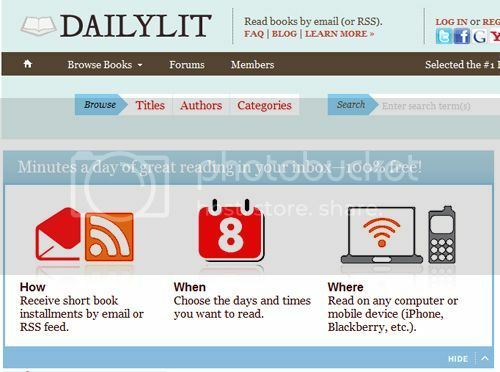 DailyLit is another book website offering to send you chunks of a book to your email address or through RSS feed. Sign-up is free and highly advisable so you can join in its community and even get personalized services. This site boasts of its active forum made up of book enthusiasts who you can ask for recommendations, reviews, book requests or just so you can keep yourself updated with the latest trend and the newest addition in the book world. The installments DailyLit sends out can also be read in other platforms including Treo, Blackberry and other PDAs that’s in the market. The books are categorized accordingly for easy selection and one interesting group is the Wikipedia Tours should you just want to learn something new like Cheese 101 or World Capitals. Daily Lit does have a wider collection and is able to offer some books for free for a limited time, which otherwise will cost readers to access online. This is made possible by DailyLit’s sponsorship program. So have a go and you may just get the hang of finishing a book or two in email form. Jessy is a geeky mom running a home-based busines sand blogging for Home Loan Finder, the free web-based mortgage broker.